Book collections: his, mine, and yours? Also, my plans for a home office rethink. Being a book collector has given me a far broader experience of books and their texts than my academic training or my academic pursuits alone could have done. Of course not every book I’ve collected will end up playing a role in the academic arguments I make, but that’s precisely the point: I do not know which books I will use until I use them. But I do know that I will probably not use a book I am not at least somewhat familiar with. Do some of you collect books? If so, what role (if any) have they played in the rest of your work or professional life? I confess that I buy old books, but only if they’re of personal or professional interest. I’m not into book collecting for the sake of collecting rare or important books, but I like to think that my purchases and careful stewardship of my books may someday be appreciated by antiquarians, bibliophiles, or even historians in the future. Longtime readers may recall that I’ve written about Vincennes, Indiana here–and more particularly, about turn-of-the-twentieth century Colonial Revival and its tendency to romanticize its roots as a French fort, as exemplified by an old popular novel, Alice of Old Vincennes. You have to appreciate the vicious anti-French (and anti-Catholic) bias of the British in the long eighteenth century: it’s nothing if not remorselessly consistent. But, hey! the kids weren’t supposed to memorize the verses preceded by an asterisk–those were just added for local color. Most Anglo-Americans in the eighteenth, nineteenth, and yes, even the twentieth century have (per Yokota’s argument) been happy to join in the anti-Gallicism and especially the anti-Catholicism! Think about how useful anti-Catholicism has been for nativists over the centuries, an all-purpose hatred that can change with the times. When the French were no longer a political or military threat, then the Irish came along! After the Irish were integrated into Eastern municipal political machines, here come the Italians, the Polish, and all along, the Mexicans and central Americans. As I was searching for Kariann’s book on my groaning bookcases here in the home office, I was reminded yet again that 1) it’s time for another culling of the herd, so to speak, and 2) it’s time for me FINALLY to reorganize, paint, and properly decorate this place. Soon I will have published two books out of this office in fourteen years, so I think it’s time to treat myself to some interior decoration. Don’t you agree? I’m not sure what role new bookcases or shelves will play in all of this. I fear that adding a new bookcase or two is like trying to solve your traffic woes by adding new lanes to the freeways: you can’t build your way out of the problem, friends. ← Three: it’s a magic number. You cannot have too many bookcases. Ever. As a transnational labour historian, I am all about collecting the various journals, newspaper and pamphlets of various left-wing groups (usually from the Anglophone world). Many libraries are getting rid of these (and in Australia, these are difficult to find anyway) so I’m slowly building an archive on this stuff in my office at university. Most of my large acquisitions have been when institutions have been clearing out stuff, but did pay an arm and a leg to get some British Communist journals shipped to Australia from the UK as nowhere in Australia had hard copies. I’m dreading the day that I have to move out of my university office because it has three walls of shelves, pretty much full. When I moved into my current office in 2009 or so, I thought I had loads of room. Now I need a stepladder as only the top shelves remain relatively “book free”. I agree with you that a redecoration of your home office is in order. 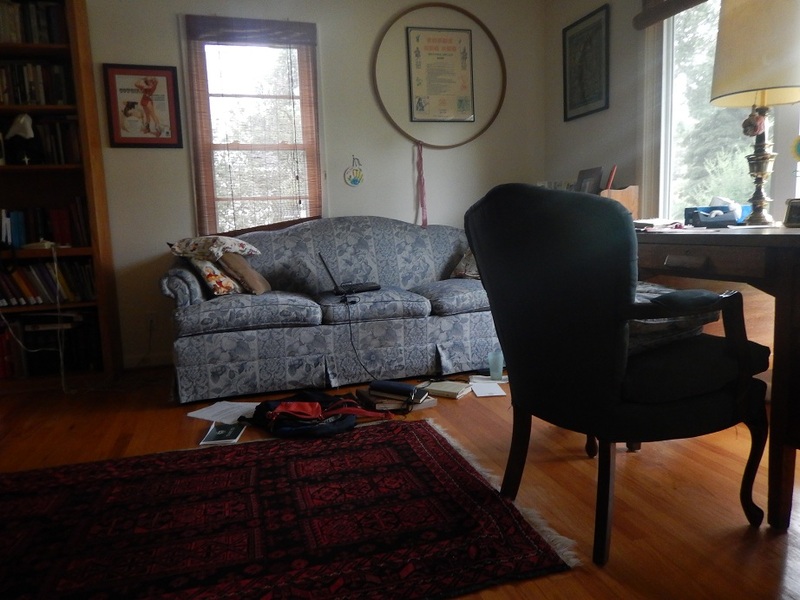 Think about how you use the space – is the couch important? If so, do you want to update it while you’re putting in new shelves? Is the desk and chair the right combination for the next few years? I’d love to see an after picture at some point if you do proceed to shake things up! I study South African literature and culture, and a lot of books on the subject are published in small print runs by small presses in South Africa. Every time I visit the country, I end up shipping home a case of 40 or 50 or 100 books, because I can’t resist this logic: “I may never read this book, but if I ever do need to read it, it may be out of print by then and impossible to find! I must buy it now, just in case!” As a result, I have a collection of books on South African literature, culture, and history that rivals any university library in the mountain West. Many of them have never been cracked, but many others have proven unexpectedly useful years after their purchase. It also means I struggle to pay off my credit cards for months and years after each visit. And I’ve long since run out of shelf space for them all. And moving is a nightmare. Despite my showing obvious symptoms of the syndrome, something about the term “collector” rubs me wrong. Maybe it’s my background in the world of indie rock and college radio, where a “collector scum” is someone who buys up all available copies of limited edition vinyl records because of their hoped-for future value. Music is for listening, books are for reading… or at least waiting patiently on a shelf to be read. I buy books, but not the sorts of books he talks about, the first edition of *Ulysses* or whatever. I just can’t afford a First Folio. (I do have a facsimile, and have a fair number of other facsimiles, since professional organizations tend to produce them.) Frankly, my salary won’t support a “collection” of first editions (unless they happen to be an academic book that won’t have a second edition). Inspired by your post, I just posted about this; it’s a great question. The collecting I do is primarily to read the books. I buy the old/first editions when I can afford them because there’s nothing like reading the real thing; I buy obscure old stuff to read it and because I might write about it some day. The things I’m dealing with are not as rare as the early materials that you’re collecting, so I don’t think of this as a future resource for someone else. Nice home office, by the way! Hey, Historiann! Thanks for linking to my blog (again). For what it’s worth, I think that if you think about yourself as a steward of old (or not so old) books, you are a collector. For me, there’s a difference between holding onto books and valuing them for what we might call their use value (for reading, for their specific scholarly or textual contents) and valuing them as part of our cultural heritage. Since historians and English professors are in the cultural heritage business already, I always (foolishly? incorrectly?) think they must look at their own books that way. Certainly, many of the archives I’ve consulted in libraries owe their existence, at least in part, to the past activities of individual collectors. Will my own collection–or yours–have such a future? Who knows? 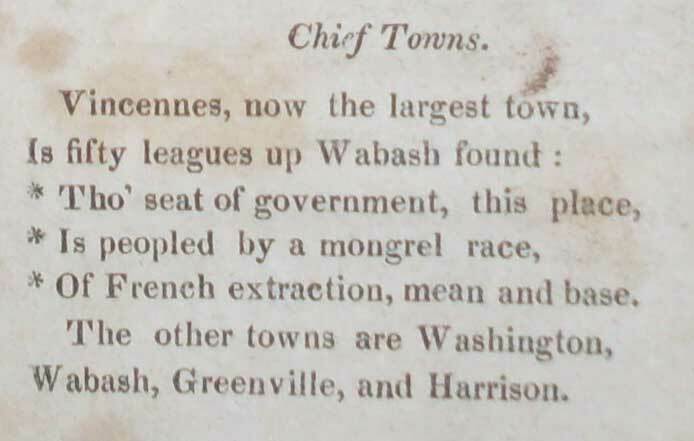 When Judge (John Cleves) Symmes rode into to Vincennes from New Jersey, via Cincinnati, in 1790–as “Illinois” was being only nominally anglicized and Americanized, he was just plain A-Palled! He wrote: “The men here are barely one removed from the Indians, and yet they are the greatest slaves to their wives in the world, they milk the cows–cook for the family–fetch and carry and in a word do everything that is done in doors and out, washing their linen excepted, while the women spend their time walking about, sitting at their doors, or nursing their children from morning to night, and if I might judge from the contrast I am led to suppose that through the night the men are obliged to observe an humble distance.” (Symmes to Robert Morris, June 22, 1790, _Correspondence of John Cleves Symmes_, 290). (cf., for comparison, in another part of the French interior, Susan C. Boyle, “Did She Generally Decide? Women in St. Genevieve, 1750-1805,” _William and Mary Quarterly_ (1987, 775-789). Add to the list above Pacific Island Catholics from the Spanish imperial diaspora. I tend to “end up with” books more than I collect them, and I really can’t cull. I would only think of doing it to install a couch like that one, but instead I’m looking for more shelves. I have bought a lot of old books–sixteenth through eighteenth century Latin books–for my research, especially in the old days when, though my salary was low, book prices were lower. Back in the day there was a shop in Hampstead whose owner would put a fresh lot of Latin books out for sale every Saturday morning, for between 2 and 10 pounds. A little bit of spending money went a long way there. I always concentrated on books I could use for my research. Now that so much is digitized, I am totally out of room and prices are much higher, I’m buying very selectively. Eventually a few rarities will go to fill holes in Princeton’s collections, but I hope to find good private homes for the rest–homes where they will be read and used. I like Tom’s notion of being a steward and hope I am one in my way, even though I’m not forming–and won’t be preserving–a massive, systematic collection. Well, not systematically. I’ve never quite had the money to do that. I do buy old and valuable books for work, and might be said to be collecting a particular set of editions of Renaissance plays not by Shakespeare (the New Mermaids, whose design I love). Most of the sporadic, half-effort collecting I do is in an entirely unrelated field, related to my former creative practice. I more or less collect science fiction of a particular literary type, or maybe just science fiction writers whom I consider useful role models. Some is just amassing out-of-print works for my own use. But there’s an on-again-off-again attempt to collect the works of a particular editor and early examples of a particular bibliographic format. And I have made an effort to collect the works of a particular writer my own age (following Gertrude Stein’s shrewd advice to collect one’s own generation). I have a pretty deep collection from some phases of her career (chapbooks, early magazine appearances, etc. ), but there are still long gaps when I didn’t have the spare cash to be a completist. Also I’ve bought a particular old paperback, an Ace Double, just so I’d have an example of that peculiar format, the dos-a-dos, to use as a teaching example in a (still hypothetical) history of the book course. That book contained two novels I don’t want to read, but they were bound together in an interesting way. In a melancholy way, I’m wondering what Kindle will do to the book-collecting of the future. Maybe real books will become even more valuable, sacred artifacts. As a friend of mine once put it, predictions of the end of codex have been around since Guttenberg’s time. Panic about ebooks seems to have been overinflated; I think they’re just another way to buy and read books these days–and why shouldn’t publishers offer books in as many formats as they can in order to sell more books? There was an article in the Denver Post last weekend about the surprisingly “meh” response to ebooks in independent bookstores. Apparently, the kind of people who buy books at independent book stores these days actually want to walk out with a book in their hands! A material, physical, codex book! I have a lot of thoughts about how and why we must still publish physical, material, codex books, worked out as I’m going through the process of making decisions about what I want my next book to look and feel like and how I want it to work. Long story short, I think we need to make them as appealing and useful as freestanding objects as they can be.